The treatment of wide-necked cerebral aneurysms represents a challenging problem for neurosurgeons. The recent development of stents has provided clinicians with the ability to treat these aneurysms while keeping the parent vessel patent. Flow Diversion is an endovascular technique where, instead of placing coils inside the aneurysm sac, a cylindrical, metallic, mesh stent is placed in the parent blood vessel across the aneurysm neck. These stents differ from traditional stents used for heart procedures in that they divert blood flow away from the aneurysm dome. The presence of a metallic stent within the artery lumen increases the risk of thrombosis (clotting of the blood) and stroke, and requires the patient be maintained on two anti platelet agents (usually aspirin and another agent) for a period of six months until the stent is incorporated into the artery wall. The stent prevents the coils from exiting the aneurysm and maintains the pressure on the coils necessary to keep the aneurysm under control. The stent then acts as scaffolding and “assists” the coils be securing them in place and preventing them from falling out. Over a period of time, natural healing occurs an blood clots on the coils. This diverts blood away from the weakened vessel walls and prevents a rupture. Flow Diversion may be used to treat large or giant wide-necked brain aneurysms that are poor candidates for other types of procedures. Coiling of the aneurysm is often combined with placement of a flow diverting stent to encourage thrombosis within the aneurysm. Complete obliteration of the aneurysm may require weeks to months. Flow-diverting stents are now the treatment of choice for large and giant aneurysms involving the most proximal (cavernous) segment of the internal carotid artery. In general, the use of stents, including flow-diverter stents, is limited to the treatment of unruptured aneurysms because of the need to place the patient on two antiplatelet agents which increases risks of bleeding. Conceptually, flow diverters allow endoluminal reconstruction rather than endovascular filling. 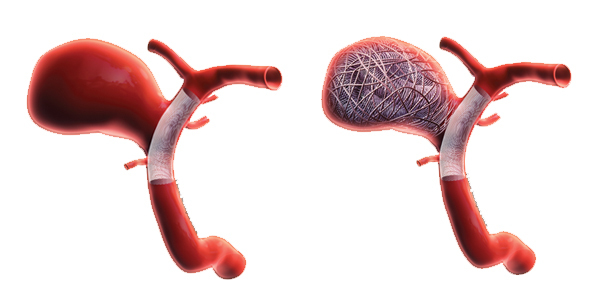 Furthermore, when used for fusiform aneurysms these processes allow reconstruction of a smooth endothelial covered channel in continuation with the parent artery. These features are thought to allow for durable reduction in rupture rates. With time, the aneurysm shrinks and collapses around the device construct relieving symptoms from mass effect. The thrombosis and associated inflammation of the aneurysm may be accompanied by temporary perianeurysmal edema in surrounding brain tissue. In summary, flow diverters take advantage of hemodynamics, thrombosis, inflammation, healing, and endothelial regrowth to achieve endoluminal reconstruction and aneurysm obliteration. The Pipeline™ Embolization Device (PED) is currently the only system available in the U.S. for blood flow diversion around brain aneurysms, with several others in the FDA approval process. It is a minimally invasive procedure where a braided, platinum and nickel-cobalt chromium alloy wire mesh device is placed within an artery in the leg, giving doctors the ability to treat some of the most complex and dangerous aneurysms. The treatment is focused on reconstruction or remodeling of the weak blood vessel harboring the brain aneurysm. The Pipeline™ Device restores original, natural blood circulation while providing permanent long-term occlusion. During the procedure, the Pipeline™ Device is implanted across the aneurysm neck, thereby slowing the flow of blood into the aneurysm, allowing for the diseased vessel to heal. Pre-Pipeline Stent: Pseudo aneurysm with a tear on the inner artery wall allowing blood to swell into an aneurysm until a bleed or hematoma occurs. Post-Pipeline Stent: Flow diverter is put in position to block the inner artery wall tear while allowing blood flow to other branching arteries. 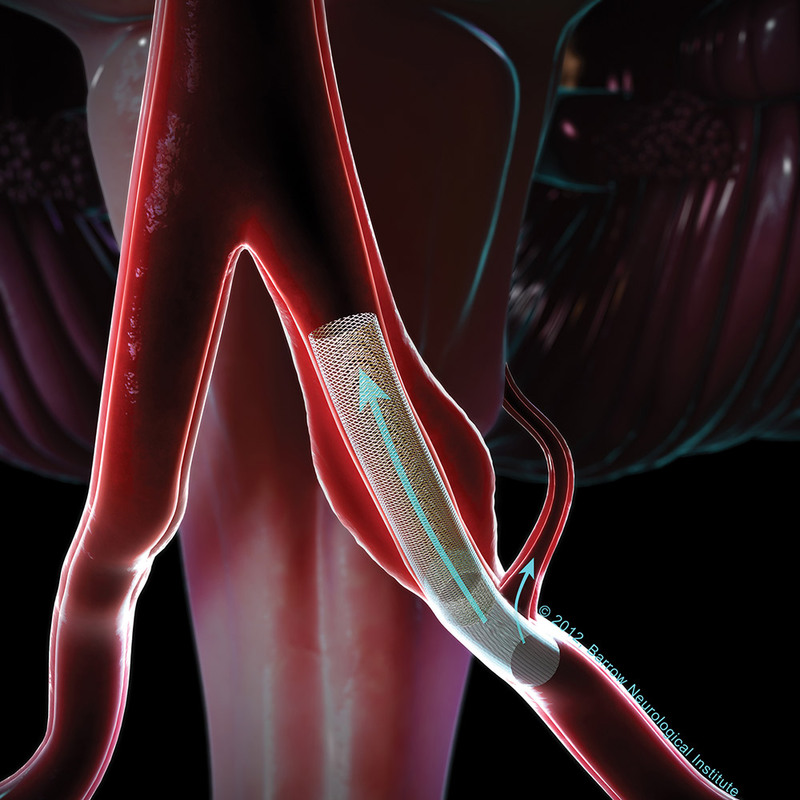 The thinness of the device also allows for telescoping or endovascular bypass, a technique where multiple PEDs are placed within each other with less risk of narrowing the artery while creating a new and stronger blood vessel. 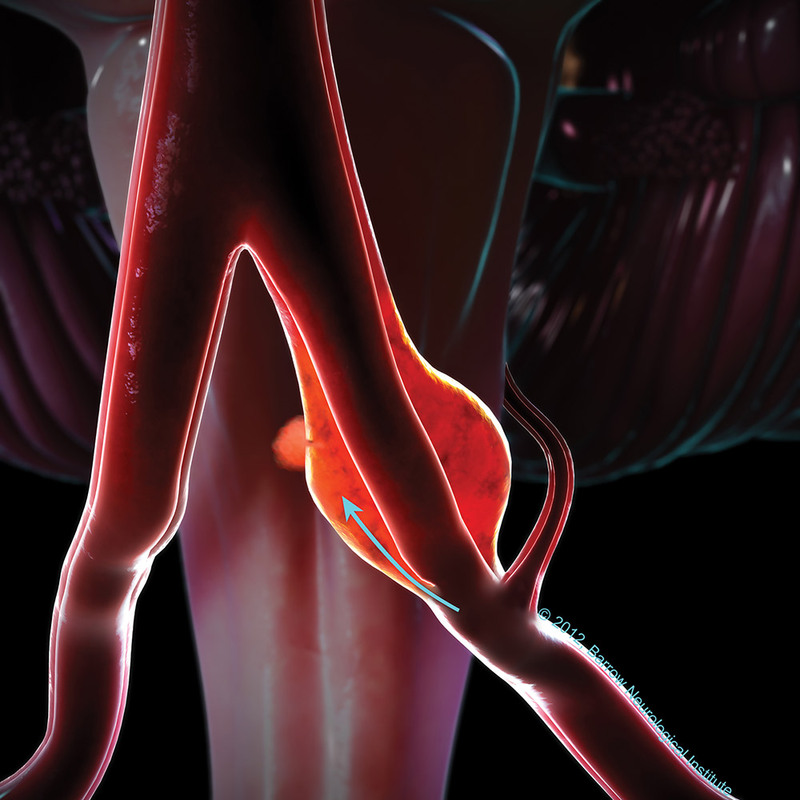 By causing the aneurysm to be completely blocked, treatment with PED is intended to reduce the likelihood of an aneurysm rupture or reduce the likelihood of an increase of the size of the aneurysm, which also increases its risk of rupturing. A successfully treated aneurysm will often shrink in size over time.